Singing and dancing is a big deal with my kidlets. Singing builds community, activates lots of areas of the brain, and there are so many cool songs that teach curricular content (as well as great ones to sing just for the pure joy of it). Dancing gives my kidlets a chance to move their bodies, use large muscle groups, be aware of their bodies and the space they are using and connect their bodies and their brains. I often tell the kidlets that we need to move our bodies to help wake up our brains. You need some ribbon and a hoop that a child's hand can hold. I was super lucky and a mom found a whole bag of ribbon at the thrift shop and bought it for me. 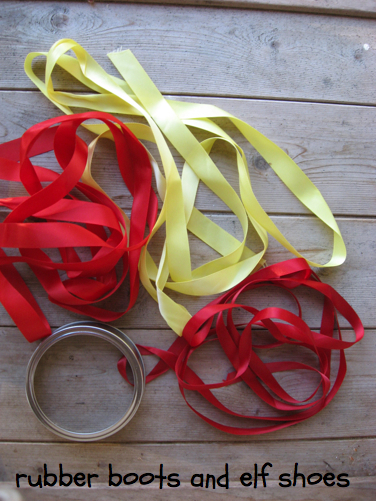 Ribbon on sale at Michael's or Walmart would work - and surveyor's tape is bright coloured and CHEAP. I used 2 or 3 lengths of ribbon about 6 feet long for each hoop. Canning jar lids worked as hoops for me - any circle the right size would work. I have seen people use curtain rings. 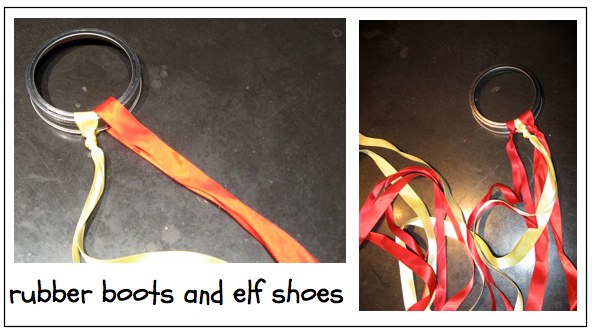 I have used two different ways of attaching the ribbon onto the hoop. This way is fastest and works best with ribbon that is not "slippery". It works great with surveyors tape. Fold the ribbon in half and make a half hitch around the hoop. Second option - works better for "slippery" ribbon. 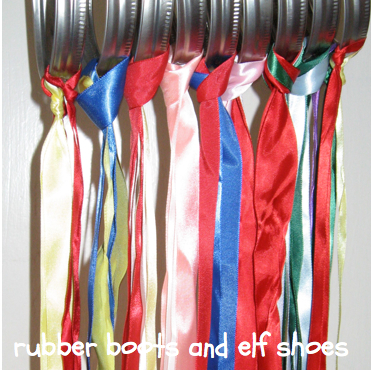 Take each ribbon separately. Fold the ribbon through the hoop. Tie it under the hoop as if you were tying a balloon. Repeat for all the ribbons. 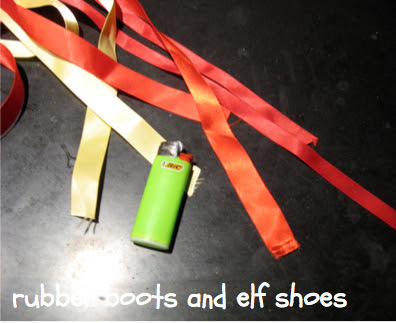 Seal the ribbon with a lighter or a candle flame so that the ends don't fray. Put on some good dancing music and enjoy. I'm putting this on my to-do list! What a great activity for my music classes...Maybe I'll have the older classes make them for the younger ones. I'm thinking the olders will enjoy them just as much as the youngers!